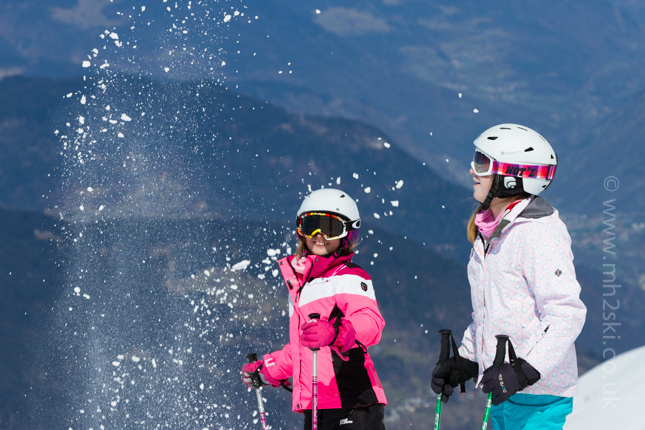 Last September I wrote a blog post titled 'Children Learning To Ski In Meribel', click here for the link. In this article I described how children learn differently to adults, and why they progress at a speedier rate. 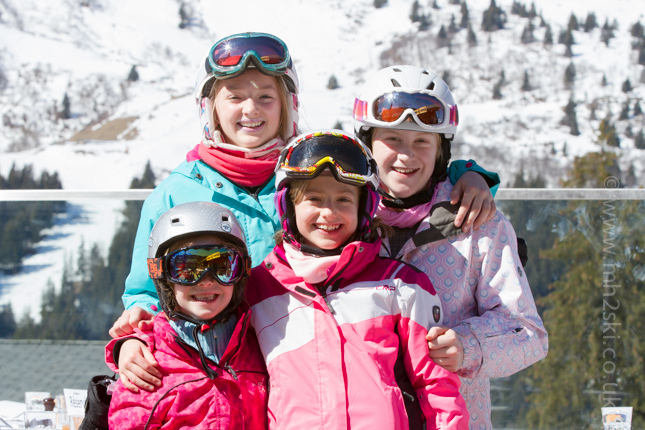 Only last week was another busy school holiday period in Meribel, being Easter. Sure enough, there was a demand for Private Ski Instructors at this time. It was the second year in a row that I was asked to teach the same family, which was a very fun experience last year, so it was another week I was very much looking forward to. So how do I approach teaching children? 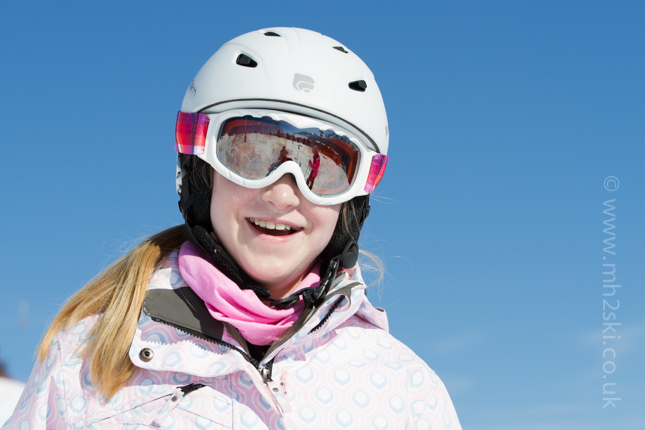 Whilst qualifying through the BASI (British Association of Snowsport Instructors), one of the many recommended methods is something called SEL. This acronym stands for Safety - Enjoyment - Learning. 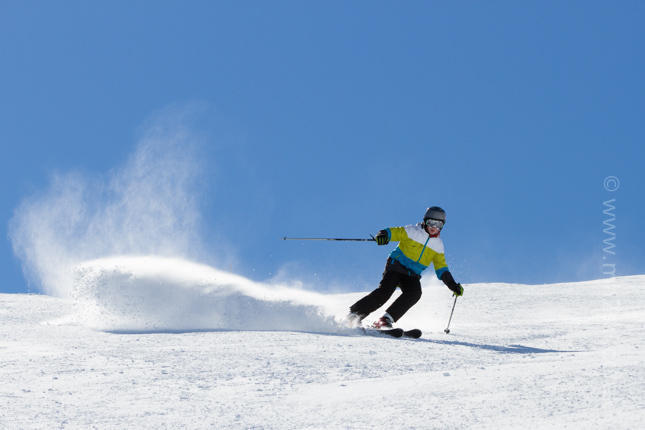 This stands ski instructors in very good stead, because let's face it, having structure can be very beneficial. I'll skip the 'Safety' side of things for just a few seconds, because this blog post is almost getting too serious akready. Onto the 'Enjoyment' part. I'm utterly rubbish at remembering jokes, so it is a great opportunity for me to learn new ones from children. So each day I asked them to tell me a joke. Here is the first I was told. "You're a pooh........ get it?" We were off to a good start, just my type of humour sadly, and I nearly fell off the chairlift when I heard it. Anyway, back to my serious hat, 'Safety'. This is such a large area, and I'll try to summarise it as much as I can. Speed - ie keeping it down. 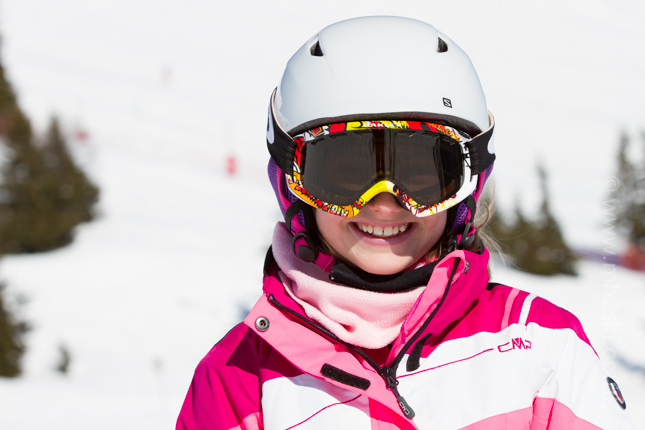 Yes, children do love to ski fast, it is fun for them. But we can all ski just a little too fast and often get away with it. This also means it is much harder to work on our technique and improve if skiing too fast. Next up, jumps. 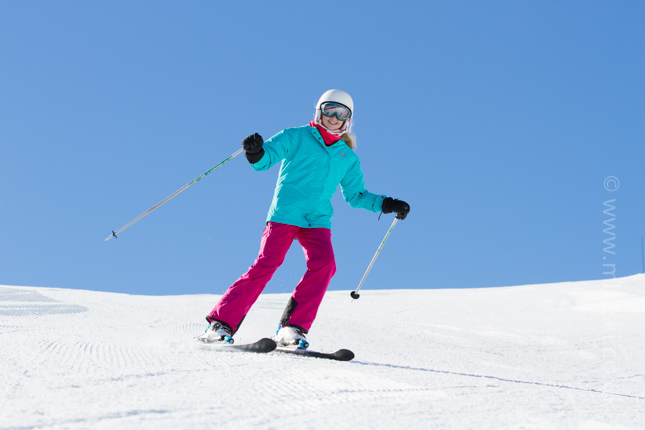 Kids will often love skiing over humps and jumping off lumps. In fact it is really good for their skiing if they do. But again, this has to be done carefully. Approaching a jump just a little too fast can have bad consequences. 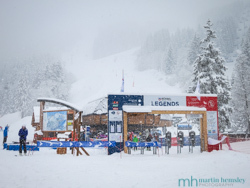 Or choosing jumps where the snow is too hard, or the piste is too busy, or there is another jump immediately after the first one, or a succession. Ooops, getting serious again, time for another joke from last week. "What do you get if you cross an elephant and a fish Martin?" "I don't know, what do you get if you cross an elephant and a fish?" Back to 'Safety'. All of these decisions about jumps need to be made in an instant, and enforced assertively at the time, particularly if the children are excited. 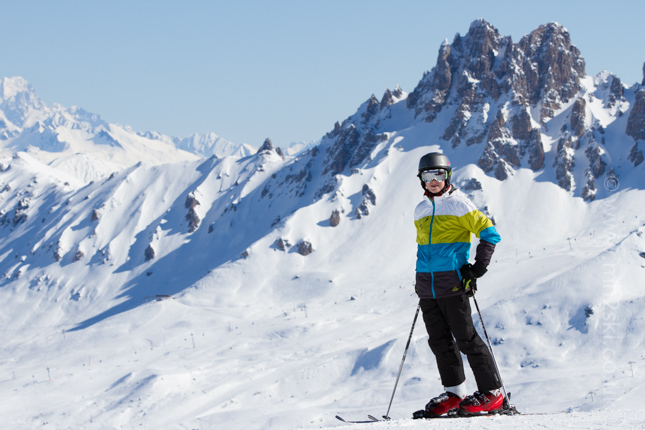 Perhaps one of the most important aspects of 'Safety' is choosing the appropriate pistes. 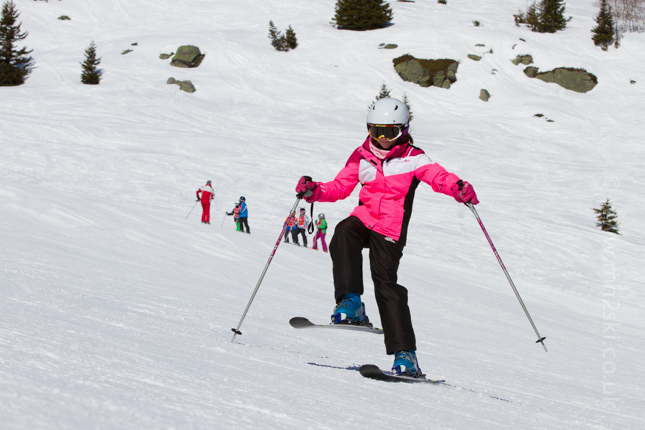 It is very important for children (as well as adults of course) to be able to practise their skiing on pistes that aren't too steep. Firstly to help them improve and practise their skills, secondly to make sure that no bad habits develop, and thirdly to make sure they aren't scared out of their skins! 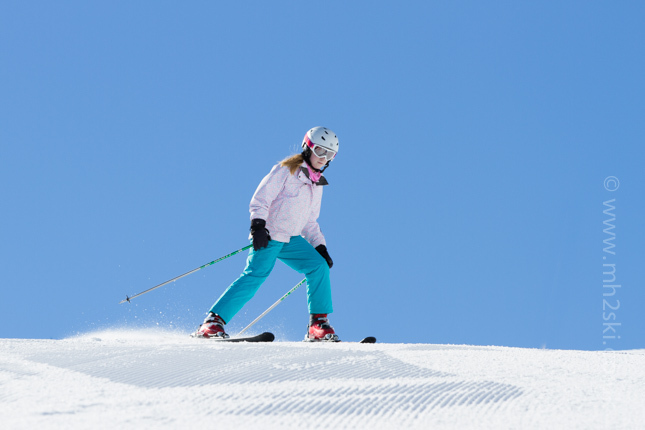 Adults can normally make their own minds up to choose which pistes to ski down. Children, however, are very easily lead by older kids, or adults. Because afterall, children are used to being told what to do by adults aren't they? Sometimes this is good, sometimes it is bad. 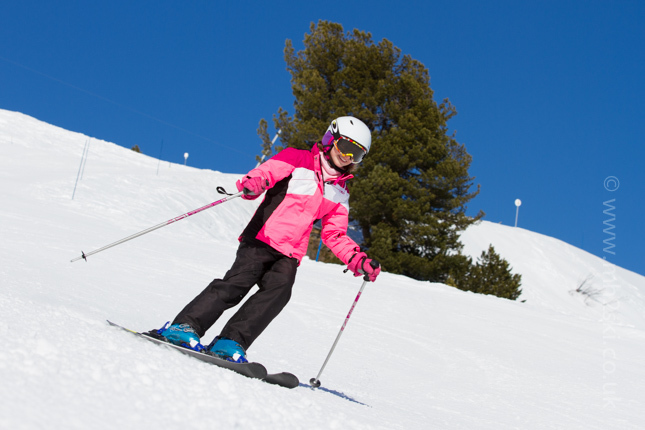 One example of this can be, let's say, a child who is learning to ski for the first time ever. 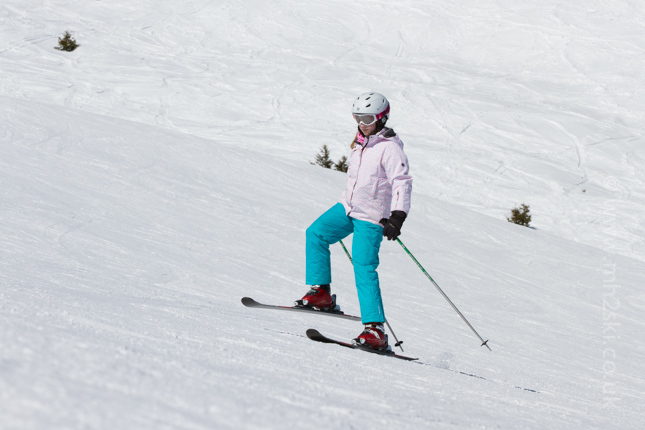 After the first morning's lesson, a child can be snow ploughing down a nursery slope, or if it is going amazingly well, they could be on their first turns down a green piste. The child is happy with their progress, and the parents are really chuffed as well, rightly so. So after a tasty lunch, a parent can think that the next stage for little Johnny is to ski him down a blue piste. A blue piste, on little Johnny's first day on skis !?! That's a disaster. I dread to think how many times little Johnny (made up name by the way) would splat on such a steep piste? Let alone have his confidence blown out of the water. Oops, getting serious and ranty again. Time for another joke from last week. "What do you call a woman who lives in the distance?" "I don't know, what do you call a woman who lives in the distance?" Right, that's enough about 'Safety', I'm sure you get the gist of it. Over to 'Learning'. Some adults can soak up heaps of technical information. If you teach in the same manner to children, they would have a yawn the size of a hippopotamus. Oh, that reminds me of another joke on the mountain. "What happens when hippos get cold?" "They get hippothermia........ get it?" 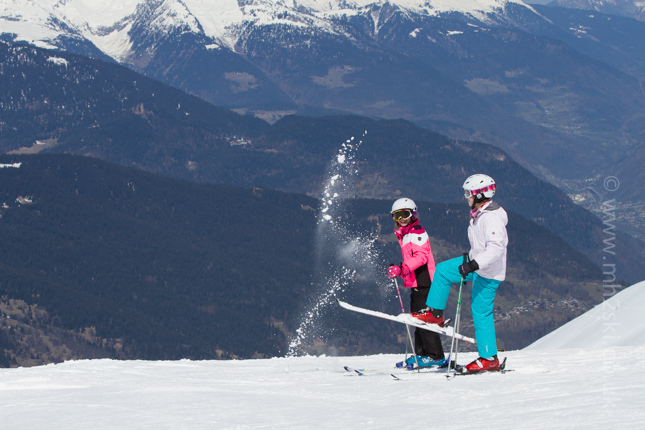 Choosing an appropriate line down a piste can really help children improve, making sure that they turn in certain places and not go direct (which is what many like to do). Adults like to do exercises or drills. For children these are changed to activities, and also transformed into games. It is a very different way of learning to ski. I could go on, but don't want to spill too many beans, otherwise I'd be out of a job! As for the 'Enjoyment' part of SEL, my goodness, the world is your oyster when on the mountain. Playing games on the snow, playing word games on the ski lifts, telling jokes..... the list is endless. Here is another from a few days ago. "What do you call a man who sleeps on a bed of leaves?" "I don't know, wha do you call a man who sleeps on a bed of leaves?" "Russell........ do you get it Martin? Russell"
Hmmmmm, some jokes were better than others last week as you can tell. Some of them I didn't understand because the girls were too busy giggling before they even got to the punch line! It was such a fun week skiing with Ollie, Mo, Charlie, Tilly, Didi and Sophie. As you can see from the photos (taken on their last three mornings), the snow conditions were absolutely fantastic for April, and the sunny weather was a real treat as well. All six of them massively improved their skiing over the course of the week, and I think you can tell that they had a fun time as well. Apologies to the parents of Ollie and Sophie, I didn't manage to take any photos of them skiing. At the end of the last morning's lesson, the parents invited me for a drink on the mountain before they were due to leave resort and go home. Never a man to say no to a large beer, we all went to the nearest mountain restaurant. It was nice catching up, and having a right old gossip about all sorts of things. Just as we were finishing our drinks, they suddenly remembered to tell me their joke that they had been saving all week. "What's the difference between a ski instructor and God?" "Not sure I like the sound of this. 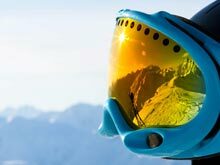 So what is the difference between a ski instructor and God?" "God doesn't think he is a ski instructor................................ get it Martin?" The childrens faces were glazed over, they didn't understand it. And tumble weed rolled past our table. "Do you get it Martin? God doesn't think he is a ski instructor........."
"Yes, I get it. What a joke" I said as they were rolling around with laughter on the terrace of the Rhododendron Mountain Restaraunt, thinking how awkward the moment was! "Don't look so worried Martin, we don't put you in the same category." they said. Phew that was lucky. And on that note, off they went to go and catch their taxi. If you enjoyed this blog post, you might like to read another from a couple of months ago, click here for the link. It is a nice reminder of what a great winter we have had. Feel free to share away on Facebook, Twitter, and Google+ by using the social media icons. Or please leave a comment below. 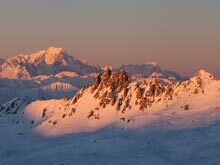 We are almost at the end of another ski season here in Meribel, with just a couple of weeks to go. Martin.